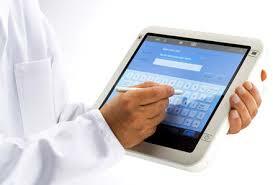 Mobile Health Computing: How Many Doctors Use a Tablet PC Like a Tablet? I've seen so many promotional campaigns that show physicians using tablet PCs like a tablet. They are actually writing on the screen and using a pen to click and input their data. However, is this reality? How many doctors actually hold a tablet in their hand? Most seem to still use them as a laptop so they can type on the keyboard. They are really missing out on productivity gains! I realize that there are some physicians who use a tablet as a tablet. However, this group is small and needs to expand. What needs to happen to cause physicians to break out of their mold and embrace pen-based computing? I have seen several doctors use the Toshiba clamshell (swival top) model and the Motion tablet. The clamshell seems the most accepted - less expensive and doesn't need to be docked in order to access the keyboard.